Twenty years after Celia’s best friend, Djuna, went missing, memories of that terrible day come rushing back—including the lie Celia remembers having told to conceal her role in Djuna’s disappearance. But when Celia returns to her hometown to confess the truth, her family and childhood friends recall that day very differently. As Celia learns more about what may or may not have happened, she becomes increasingly uncertain whom she should trust. 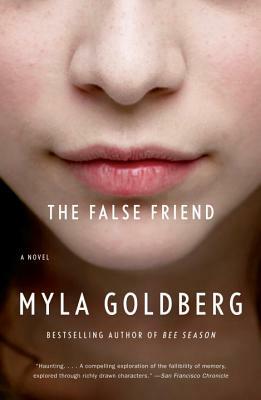 In The False Friend, Myla Goldberg—bestselling author of Bee Season—brilliantly explores the cruelty of children, the unreliability of memory, and the unpredictable forces that shape our adult selves. Myla Goldberg is the author of several books, including Wickett’s Remedy and the bestselling, critically acclaimed Bee Season, which was widely translated and adapted to film. She lives in Brooklyn, New York.